This is the second polish in Nails Inc.’s collection of “Holler-Graphic” polishes that I am showing on the blog. The first one was “Cosmic Cutie” that you can see if you click on this link. The formula requires a light touch and as few brush strokes as possible in order not to drag the polish off the nails. I only used two coats for full opacity and the drying time was really good. The patterns on my nails are water decals. They were a bit flimsy so it took me three or four attempts to actually get a decal on the nail, haha! But in the end I got decals on all the nails. This is the final design including topcoat. The photo is taken in the evening sun. Here’s a picture of Cosmic Queen alone; this is two coats and no topcoat yet. 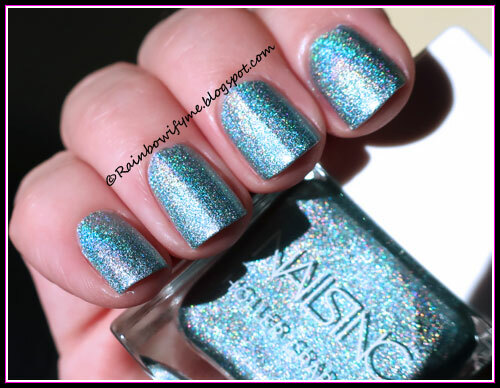 I’m quite looking forward to trying the others holos from Nails Inc! Overall impression: Great base for nail art. Tricky formula. Very pretty polish. 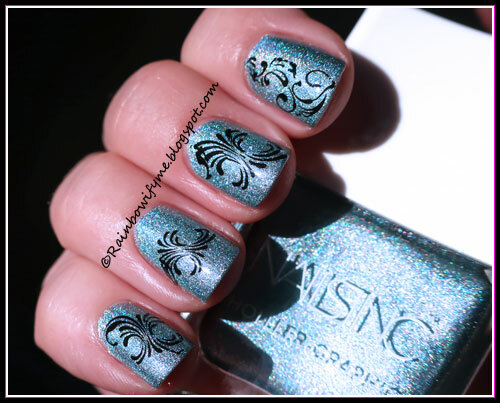 I like this Holo and the nails design on it.